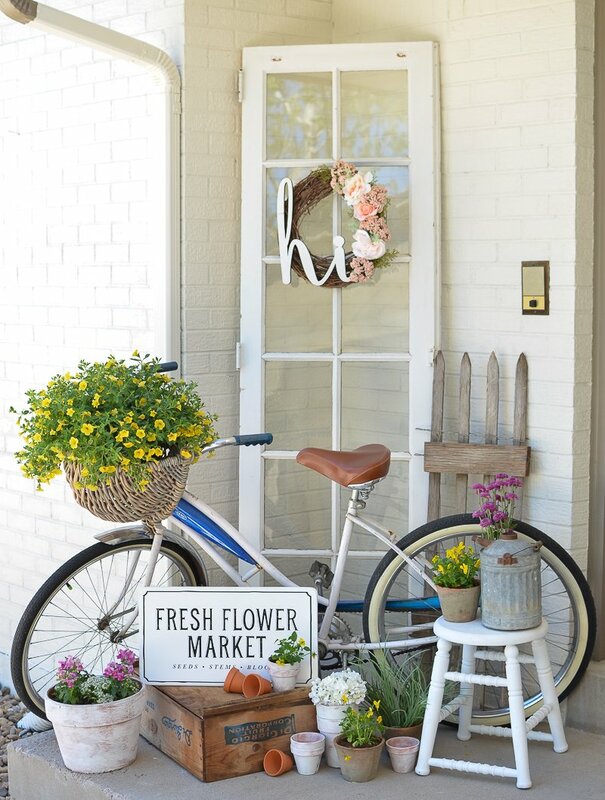 Can I just start this post by saying how darn excited I am to show you guys my farmhouse style summer porch? Now, I realize we aren’t technically to summer yet and I don’t technically have a porch, it’s more like a little stoop, but just humor me, ok? This post is probably one of my all-time favorites I’ve ever shared here on the ol’ blog and it’s all due to the fact that I finalllllllly get to share my grandma’s vintage bicycle with you all. See, a few years back I was lucky enough to inherit this bike and I’ve loved it dearly ever since. When I got it the seat and one of the tires was in pretty rough shape, so we replaced those and of course I had to add a cute basket to the front. I just couldn’t have an old bike without adding a basket. Anyway, it still rides like an absolute CHAMP and it’s in great condition overall. Most of the time I keep it tucked safely away in storage, but I’ve been itching to bring it out and use it on our front step for a while now. Well it’s finally happened and OMG–I looooooooove it you guys. Love isn’t even a strong enough word to describe how I feel. Obsessed, maybe? I don’t know. Either way it’s marvelous. And I kinda wish I could keep this space looking exactly like this for the rest of time. Isn’t she a beauty?! 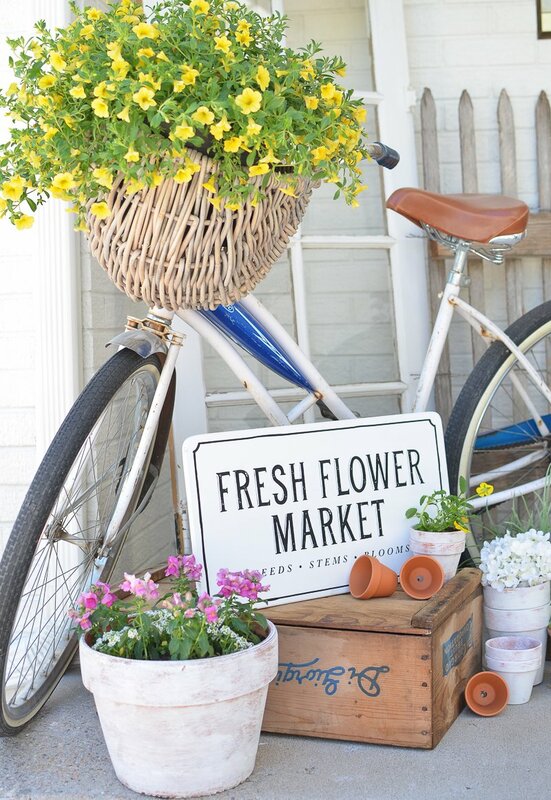 That giant bucket of flowers fit perfectly in the basket on the front of the bike. It was meant to be. 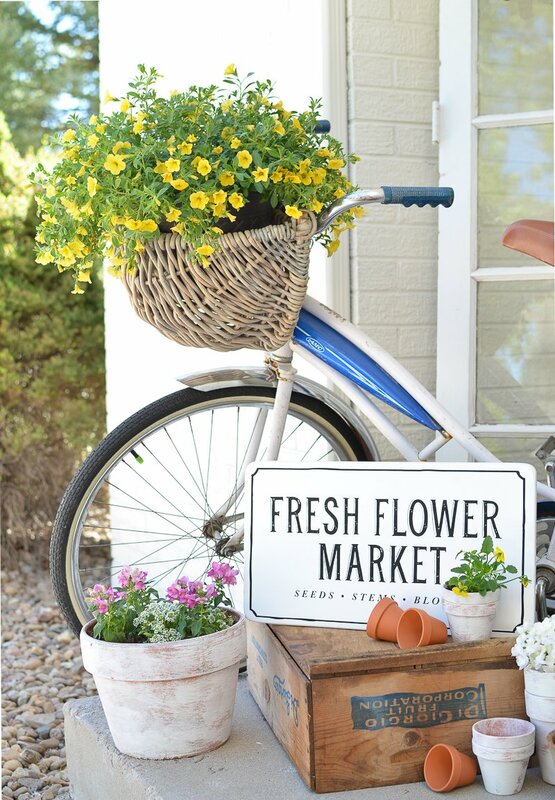 I picked up this Fresh Flower Market sign while we were visiting Magnolia Market in March, but you can find tons of very similar options on Etsy. I found a bunch of great flower market signs here. 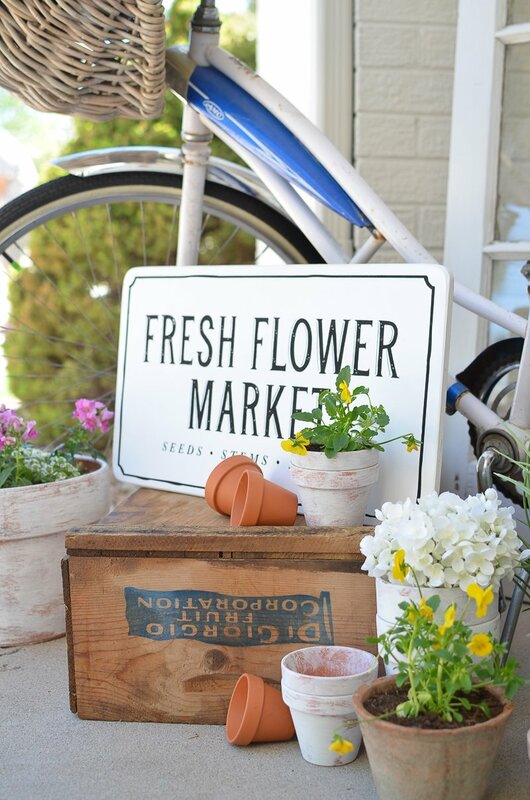 Pretty much everything else here is a thrifted find–like the old door, picket fence, and that old wooden fruit crate. The pots are all from Michael’s, I just painted a few of them white. This little stool used to be a tall oak bar stool that we just cut down a bit and then painted white. I use it all over the house, it’s super handy! I actually shared how I made that cute little “HI” wreath last week. Did you catch it? 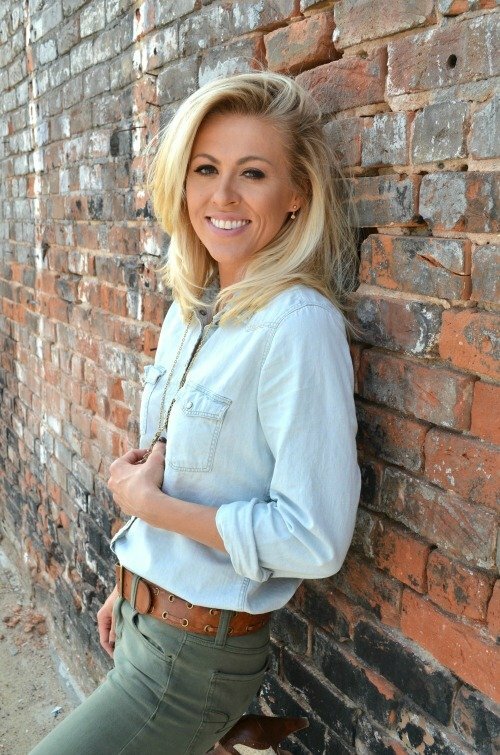 If you’re interested in seeing that be sure to check out this post–it was super duper easy! 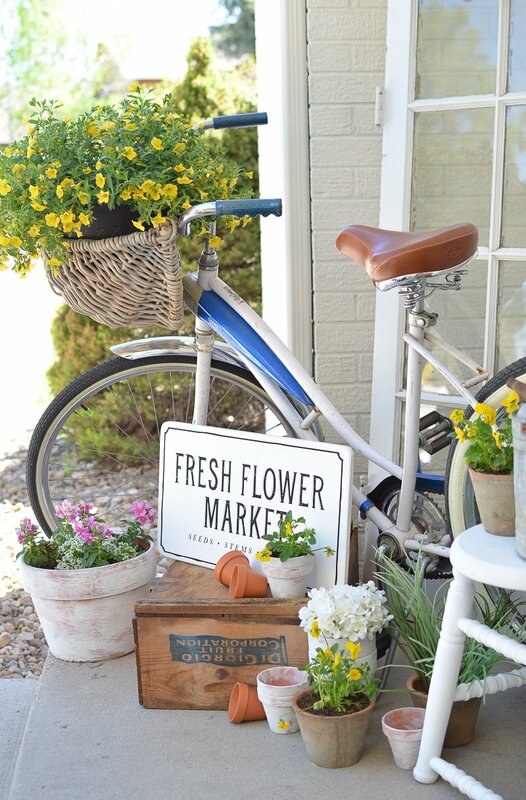 I just don’t think summer decor gets any better than an old antique bike and lots of fresh flowers. I mean, they’re doing all the hard work for me in this post. All I did was get my camera and document it–which I was happy as a clam to do. I’m SO blessed to have my grandma’s bike. I can’t help but think of her and her sweet little face every time I look at it. It really is one of my favorite possessions. I just wish I could keep this spot looking exactly like this for the entire summer. A girl can dream, right? Too bad I’m really bad at keeping flowers alive. Like, really bad. It’s pitiful. I either over-water them or I completely forget to water at all, there is no in between for me. So do me a favor and say a prayer that these pretty flowers survive, ok? I need all the help I can get. Oh my goodness! That is super cute! I can’t stand it, I’m a little jealous. We live in the country and I have to be very selective with what I put on my porch so the wind doesn’t carry it away. I love your posts, you’re so inspiring. Keep them coming! I have the same issue Barbie! Plus the deer love eating all my flowers, which doesn’t help with their survival rate at my house. 🙂 Thanks so much for dropping by! I love it! I especially love your wreath! I’m going to attempt one soon! Everything looks so gorgeous! Oh yay! It was super easy, you will love it. Sooo pretty and fresh looking. We have a little ‘stoop’ on our front house, too. 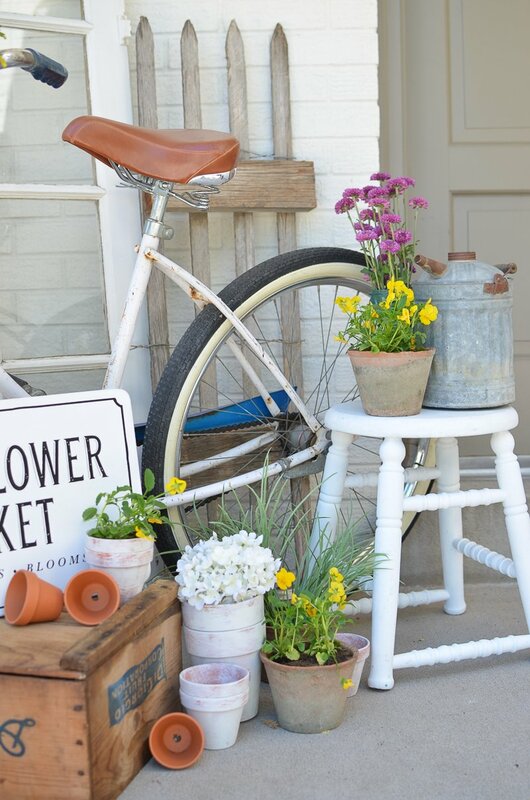 I found a vintage metal setee and painted it white, got an old plant stand, and painted that white, and took a vintage watering can and arranged artificial yellow flowers (had to be artificial cuz there is no light in the back of the porch) and had a vintage garden statue of a little girl and used that….oh, and my front door is painted yellow with an yellow/red/white wreath. 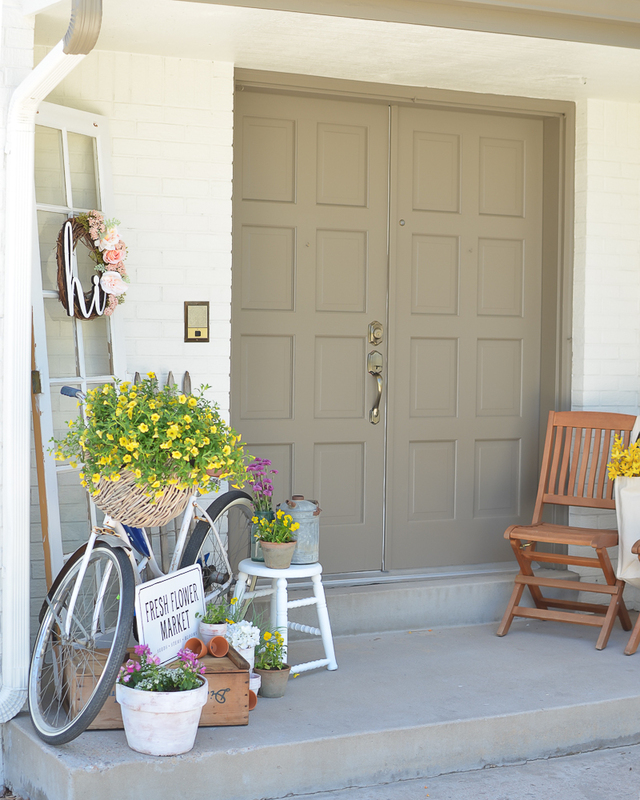 So many people have stopped to say how refreshing the front porch looks….Yellow does that, I think. Our house is red brick (1966), and this makes the front of the house “pop”…LOVE your yellow! Oh wow Sharon, your porch sounds amazing!! And I agree, yellow is the perfect color for spring and summer. Well actually all year round, it’s my favorite color to use in my home. looks wonderful! 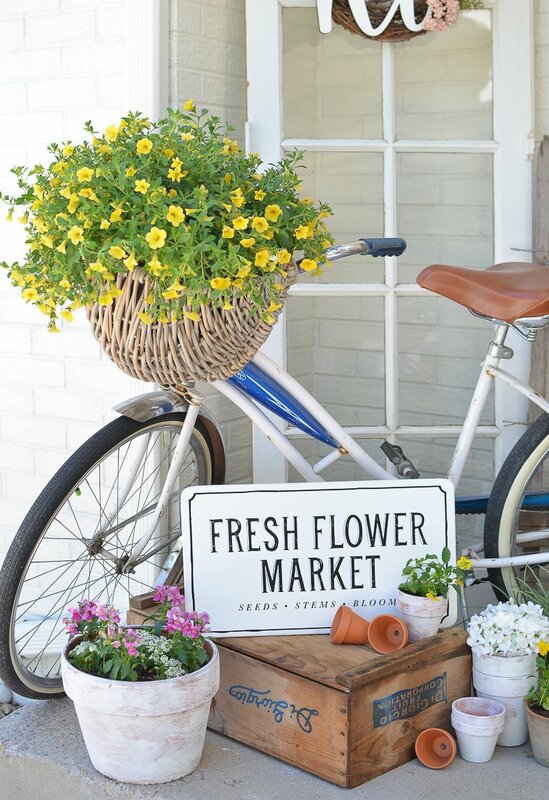 that bike basket of flowers is gorgeous! 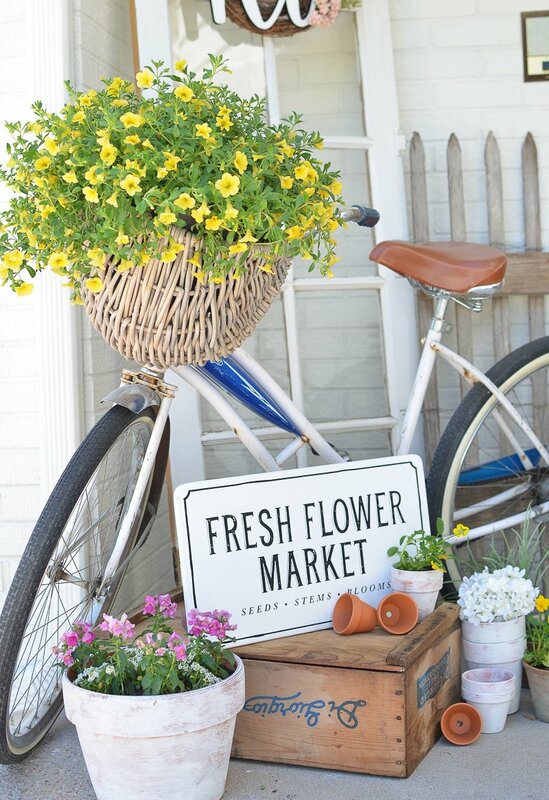 Thank you Kim, I was so excited when that bucket of flowers fit perfectly in the bike’s basket! LOVE THE BIKE….EVERYTHING LOOKS GREAT!!! Soooooooo CUTE!!! You inspire me daily!!! I’m going to attack my porch today!!! ???? Aw thanks Mary, so glad I could give you a bit of inspiration to tackle your own porch! Adorable! I love it, too. I can hardly wait for our new house to finally be finished so I can start doing cute things like that! A new house!? That is awesome Paulette. You will definitely be busy this summer! 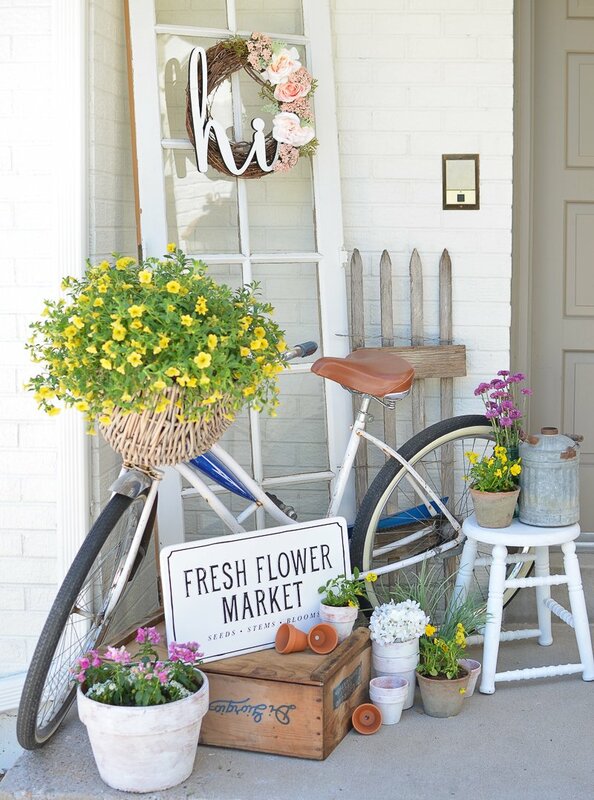 Beautiful porch and I’m going to look for those pretty flowers! The bike brought back so many memories for me! I hope you are feeling good with the later part of your pregnancy! I found my flowers at Home Depot actually, I was surprised at how great their selection was already. Thanks for dropping by and your kind words Rondell! Sorry, forgot to mention that I shared my bike on instagram and have you as one to follow! #1014thblvd . How adorable and special! Flowers are such a wonderful thing, the best part of spring and summer to me. I can go a little crazy with plants and flowers, but I kept it to a minimum this year. Less work and less watering…grin. I totally agree Brenda, flowers make the world better in my opinion. It’s the simple things! But they can be a lot of work too. Fingers crossed I keep mine alive! Looks absolutely adorable! Just hope no one steals it. 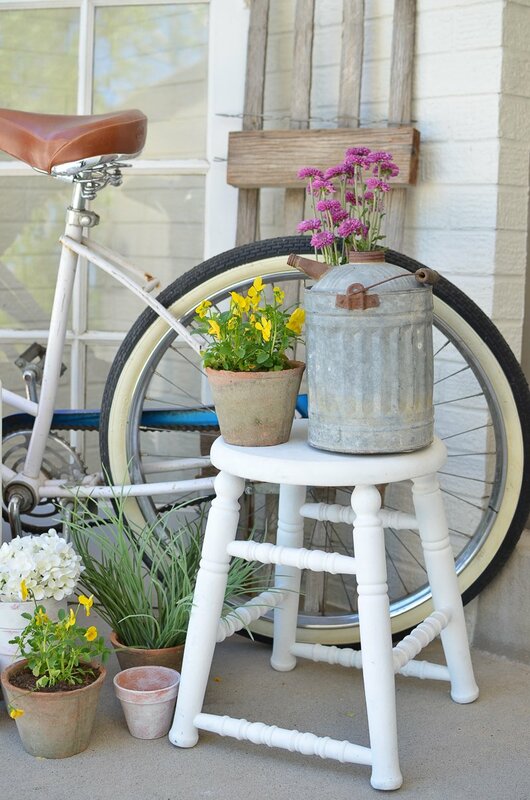 A simply “PERFECT” spring/summer porch vignette! Kudos for a job well done???? Sarah, what a beautiful porch setting. I adore the bike and everything else. Thanks Doreen, I was actually surprised I could fit all that up on our little stoop but I love how it came together. What a wonderful welcome home! It’s adorable! For flowers…set an alarm on your cell phone for same time of day you’re normally home…to remember to water them….if you did it yesterday, ignore it today….in 3 weeks it could become a habit! Lol…you could always replace them with a drought hardy green plant that can get by without watering everyday….if it dies…???? Or plant silk ones if you’re desperate….so cute! Makes summer a welcomed thought! Ahhh what a great idea Faith! I’m totally going to set a reminder on my phone. Thanks for the tip! I agree Sherri, it’s so much more fun when you have a sentimental piece like this bike. I’m lucky to have it! Oh Sarah that is just awesome , How do you you get those fabulous photos, they are like out of a magazine..
That’s so kind of you to say Teresa! I’m completely self-taught when it comes to photos and all that jazz. I’m working on a series about blogging now and I plan to share a photography post in that series, so stay tuned! I wish I had a large front porch to decorate like that. My husband surprised me with a vintage radio flyer wagon he found at a garage sale. You have given me some great ideas. Oh that’s awesome Dawn! I used one of those radio flyer wagons in a Christmas porch look I did last year. That’s definitely something you an decorate with all year long. Have fun! Lovely, Sarah! So bright and airy and joyful! So adorable, gonna say all the prayers so you can keep those flowers alive!